ANCHORAGE, Alaska (AP) — Former Alaska Gov. 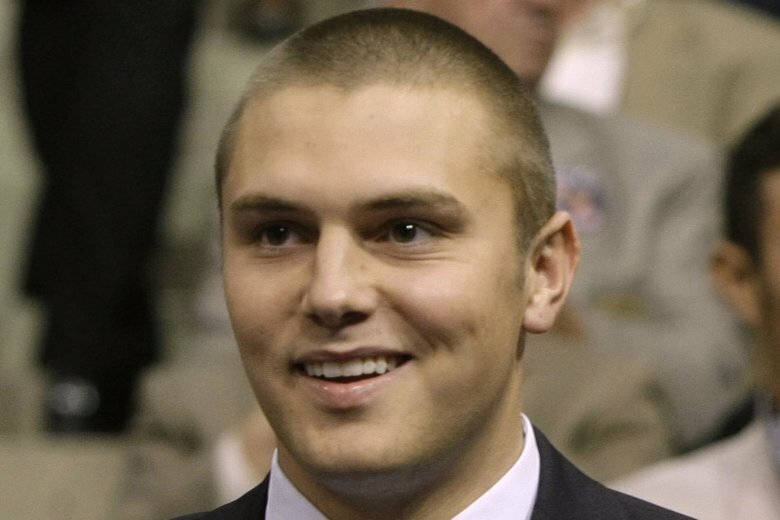 Sarah Palin’s oldest son, Track, hit a woman in the head after telling her that she couldn’t leave his house and resisted as authorities arrested him, court documents said. Track Palin, 29, is in jail facing misdemeanor charges including assault, resisting arrest and disorderly conduct less than a year after being accused of attacking his father at his parents’ home. A female acquaintance said Palin blocked the doorway when she tried to leave his house in the city of Wasilla on Friday night, according to an affidavit written by Alaska State Trooper Jason Somerville. She told authorities that he took her phone when she said she would call the police if she didn’t let her leave. She said she made it to her car in the driveway but that Palin followed her and “was on top of her, hitting her in the head,” the document said. They wrestled over the phone and he let her leave after she screamed for help, the affidavit said. Her arm had small scratches and the back of her head and neck were red, Somerville wrote. Troopers went to Palin’s house and said he told them that the two were arguing over how they said goodbye and that any injuries the woman had she did to herself. Palin said he was injured but wouldn’t explain further or let troopers examine him, the document says. Authorities said a trooper told Palin he was under arrest and tried to put his arm behind his back, but he tried to pull it forward. When two troopers tried to pull his arms back, he kicked over a coffee table, the document says. A trooper pulled him to the ground. After Palin was cuffed, troopers say they tried to put him in a vehicle but he “was pulling and shoving with his shoulder.” He threw his head back toward a trooper’s face, who moved to avoid getting hit, lost his balance and they both fell down, the documents say. Palin appeared in court Saturday, where a judge set a $500 unsecured bond with the condition of wearing a monitoring device if released. Palin, whose mother was the 2008 Republican vice presidential nominee, was arrested in an assault on his father, Todd, last December. He was accused of breaking in to his parents’ home and leaving Todd Palin bleeding from cuts on his head, authorities have said. Track Palin, an Army veteran who served one year in Iraq, was accepted into a therapeutic program intended to rehabilitate veterans and pleaded guilty to misdemeanor criminal trespassing in a plea agreement. A judge in that case set a hearing for Wednesday to deal with how the new allegations will affect his participation in Alaska Veterans Court, which gives eligible former service members the option of enrolling in mental health treatment instead of a traditional sentence. Palin’s arrest could get him thrown out of program, Anchorage District Attorney Richard Allen said Monday. If that happens, he would get jail time instead. The judge will make that decision. Palin’s arrangement in veterans court called for him to serve 10 days in jail if he completed the program. If he didn’t, he would serve a year. Patrick Bergt, Palin’s lawyer in the earlier case, said he hasn’t been contacted to represent Palin again. Palin family attorney John Tiemessen said he had no firsthand knowledge of the new allegations. Palin also was accused of punching his then-girlfriend in 2016, court documents said. He pleaded guilty to possessing a firearm while intoxicated, and the other charges were dismissed. Sarah Palin indicated that post-traumatic stress disorder might have been a factor in that case. Follow Rachel D’Oro at https://twitter.com/rdoro .